From left are Cassie Walker, Laura Lewis, Judy Jones, Sandra Dennis, Kevin Dennis, Becca Loscar, Marlene Stout, and Pastor Ray Kane. Loscar, Kane, and Stout are from Grace United Methodist Church and helped donate games to the Hope House. 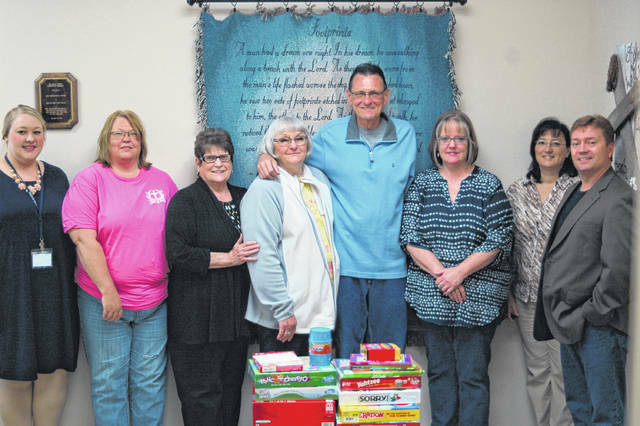 VINTON —Grace United Methodist Church has donated board games in honor of mothers to the Field of Hope recovery center for Mothers Day. The evangelism committee at GUMC has traditionally spent funds on mothers in the church each year as a token of appreciation and recognition, but chose to go a different route this time around. Becca Loscar, a member of the evangelism committee thought it would be a good use of funds to support the Field of Hope Hope House, a residential recovery center for women dealing with substance abuse. Loscar contacted FOH and spoke with Kevin Dennis, who told the committee about their need for board games; something simple yet effective in the recovery process. Dennis, along with several other employees at FOH, explained that some of the women have never owned or played a board game. Since recovery is more than simply stopping substance abuse and is about changing the direction of a life, Hope House works to teach their residents life and home skills. “One of the things we teach is life skills training, family skills training, and to be able to sit around and have a quiet evening with your family doing something and interacting with each other instead of sitting on the couch with nothing to do,” said Dennis. Residents in the Hope House are allowed visitors on the weekends, and some have families that come in with their children. The board games were especially requested by FOH to help facilitate the interaction between residents and their families during visits and after they have achieved recovery.